The rule of three has been explored, exploited and employed by famous narrators, orators and presenters throughout ancient, modern and contemporary history: Julius Caesar, Abraham Lincoln and Steve Jobs have used it in their speeches. Today’s re-elected U.S. president Barack Obama is also a well-known champion of the rule of three. Thank you for believing all the way, through every hill, through every valley. That’s why we do this. That’s what politics can be. That’s why elections matter. It’s not small, it’s big. It’s important. We believe in a generous America, in a compassionate America, in a tolerant America. That’s the future we hope for. That’s the vision we share. That’s where we need to go. Our economy is recovering. A decade of war is ending. A long campaign is now over. I have listened to you, I have learned from you, and you’ve made me a better president. The courage to keep reaching, to keep working, to keep fighting. For more reading about the rule of three, you may also check out blog posts by Brian Clark and Andrew Dlugan. 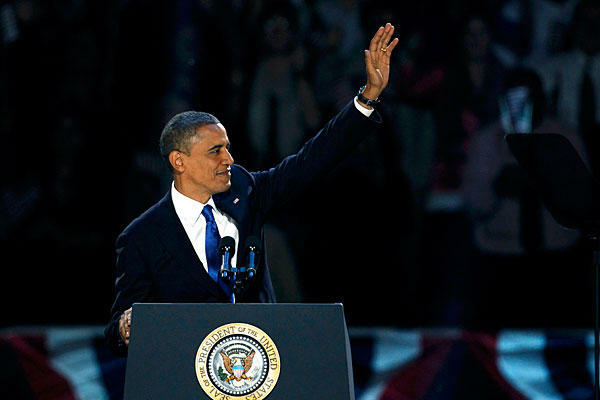 This entry was posted in Best practices, Examples and tagged 2012, Chicago, elections, Obama, speech, victory by Marc Jadoul. Bookmark the permalink.